I had never heard of Kefir until about six years ago. (It’s pronounced “kEE-fur”, by the way.) And then, while learning about kefir, I heard that there were these things called “kefir grains”, which of course made me immediately picture a wheat field. FYI – kefir and wheat fields have nothing in common – except for maybe the fact that both can be used to create consumable products. Therefore, if you are having a conversation with friends and the subject of kefir comes up – (and you know it will, because a lengthy kefir conversation is what friendship is made of) – smile, look smart, and for the love of probiotics, don’t ask something silly about what a kefir field looks like. I finally learned what kefir is, and I also learned to love it. Kefir is a probiotic beverage, similar to yogurt, only not quite as thick. This cultured dairy product is excellent for your digestion as it is full of healthy bacteria that can heal the gut. You can drink it plain, and will find that it is rich and tangy. We prefer to drink it in smoothies, blended with lots of frozen fruit to sweeten it up. Kefir grains are reusable, allowing you make batches and batches of kefir for years and years. But with my busy schedule, I find that keeping up with making sure my kefir grains are alive and healthy is very overwhelming. That’s probably silly, but that’s where I’ve landed. Begin with a quart of milk and a packet of Powdered Kefir Starter Culture. I use raw, organic milk, but this it not necessary if you don’t have access to raw milk. 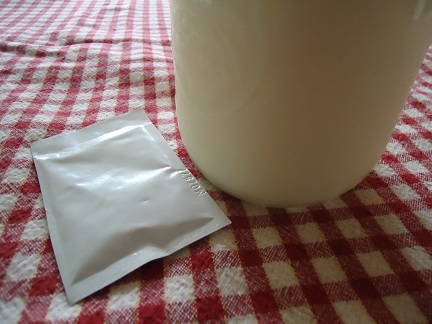 After you have poured the contents of the packet into the milk, it will look like this. Aren’t you glad I took a picture of this for you too? Okay, that’s all of the obvious pictures I took, even though I’m sure you would have loved pictures of me digging through my drawer for a lid, putting the lid on, and shaking it up furiously. Oh shucks, I guess I gave away the next steps in your kefir making process. Indeed, you need to put a lid on the jar, shake it up, and leave it on your countertop for about 24 hours – more or less – depending on how long it takes for this to “kefir-fy”. 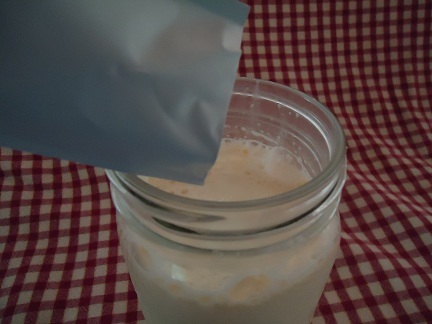 You will know that your kefir has formed once the contents in your jar have thickened. At this point, you can put your kefir in the fridge to chill. Just a note: The instructions in the packet are likely to tell you to heat your milk and do a few extra steps beyond what I have told mentioned here. You can do that if you wish. I skip the other steps because I prefer to keep my milk raw, plus I have found that cold milk works just as well as warm milk. VERY IMPORTANT!!! When using your kefir, keep about one cup at the bottom of your jar. Pour this cup of kefir into a quart or half gallon of milk, leave it on the counter for 24 (give or take) hours, and allow the milk to thicken into cultured kefir. Isn’t that cool? 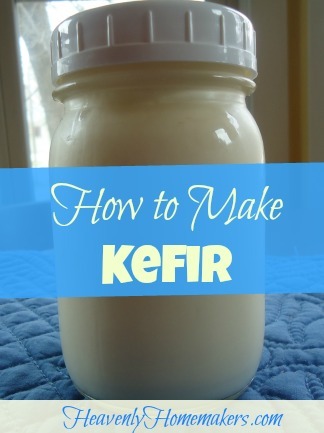 You use your kefir to make more kefir. Therefore, your kefir starter packet will make eight or more batches of kefir! So easy!! Ever made kefir? How do you pronounce it? I have been making milk kefir for a year or more. I make mine from grains. I have plenty of extras if you are ever interested in trying it that way. I started with a few tablespoons and now have over a cup of grains. I prefer it that way because I probably wouldn’t keep up with when I’d need more starter. My family would revolt if we ever couldn’t have our “mid morning smoothies”!! I got kefir grains like 6 months ago, and have cultured some milk every 2 days since. The problem is, I’m scared to drink it! It tastes so different from the kind at the store that I find myself giving it to the dog (I also don’t want to throw around words like OCD or germophpobe here, but that probably applies, too). Any tips for me to stop being a ninny and start making my own kefir? And sorry to post jack you there, Laura! I just happen to have a big jar of grains already, is all. You can start by culturing it for a shorter time so it will have a milder taste. Sometimes it’s ready in as little as 12 hours. You can also use less grains which will make it culture slower (I use two teaspoons of grains to one quart of milk – and sometimes a little less grains if we aren’t using the kefir as much and I am saving up to much). I have never been a fan of the store bought stuff because it gave me a stomach ache any time I tried it. The rule of thumb is it can be ready as soon as you can tilt the jar and it pulls away in a solid mass. Kerrie: I realize your post is about 6 months old, but…! Do you still have extras that you are willing to provide for free? I live in Virginia. I don’t know where you are, or if you can mail. Please let me know. Thank you. Does kefir have more probiotics than homemade yogurt? I’ve been wanting to try it for several months now, but haven’t buckled down and done it. I think it’s time! I was hoping to find someone in the Knoxville area who could share some grains, but I think I’ll just head to the store and pick up a starter packet! My understanding is that kefir is a little better than yogurt in the area of probiotics. And shucks, you’re probably pronouncing it correctly and I’m all wrong!! All the knowledgable people around here call it KEEfur, so I just assumed they knew what they were talking about! I call it “kefeer” too because that’s the pronunciation on dictionary.com. (Yes, I looked it up because I didn’t want to say the wrong thing.) It’s a middle eastern cultured product, so I think you and dictionary.com are correct. Tami, from what I’ve read the comparison between kefir and yogurt are significant. Yogurt is certainly beneficial but kefir has significantly more beneficial probiotic qualities. So much so that yogurt can be set aside in a direct choice. Commercially prepared kefir or starter does not contain the full list of cultures that grain made kefir will.Typically commercial product has perhaps ten live cultures while grains produce cultured milk of 30+ strains of various organisms. Search for Dom’s kefir on the web and you can learn more than you ever wanted to learn about milk and water kefir. Really? Dictionary.com says it’s pronounced “kefeer”. It’s a middle eastern cultured beverage, so “kefeer” sounds right to me whgen taking that into consideration. So, in the interest of me not sounding stupid, where did you hear how it’s pronounced? Was it a reliable source? I thought dictionary.com was, so that’s why I’m asking. We have been drinking kefeer ( so correctly to call on english this healthy product ) all my family made this product and i know all Soviet Union country has done , even until now ….still available and never stopped production of Kefeer ( Kefir ) and its still available in any food store in Russia, Baltic countries and Azia . If you have or trust someone have a cow , better to make from Raw milk ( as we did ) if you not sure about hygienic environment how was taken and stored milk , better buy organic pasteurized milk and make Kefir ( kefeer) . Is this how you do your buttermilk also – just pour in the powder, shake it up, and let it sit? I’m just wondering because I tried the powder from CFH and there were lots of other directions and I tried to follow them, but the resulting buttermilk didn’t turn out so great – not just sour, but kind of a vinegar smell to it. Regarding buttermilk, you don’t even need the powdered culture to start it. Thanks! How long can you continue before your “starter” doesn’t work and you have to buy more from the store? Can I use rice or almond or coconut milk instead of cow’s milk? Thanks! I’m not sure. I *think* it would work but haven’t tried it myself to know if it does or not. Yes, you can make coconut milk kefir. im excited to do this. Didn’t realize it was THAT simplple. do you think i could use raw goat milk does that matter with the starter? Yes, this definitely works with raw goat milk as well. How many times can you reuse the powder kefir? We’ve done the grains before but our sources for raw milk are, at times, very unreliable, and it can be a challenge to find non ultra pasteurized milk, which is, of course, a death sentence to the kefir grains. You just use the powder in the packet once, but then you use the kefir you made from the packet to make at least 8 more batches of kefir. Is there any way to do this non-dairy? I’m sure there is, but I need to do more research to learn how this works. do make kefir water. You should do a google search to see how it’s done. I had several years ago kifer grains.. I didnt know at the time much about milk kefir so i always made water kefir. Basically u put the grains in water for a week or so then bottle the water n put in fridge..several days later it is yummy n fizzy. I would add a little sugar and always had lemons or limes cut up in the water. The grains multiply over time. I was mailing them to friends giving them away just tossing them. Have moved since then and cant find the dried ones that I saved.. sadness. Do a google search…tons of info on water kefir..and btw…yes is tons better than yogurt..especially the store bought ultra pasturized sugar loaded crap they try to stuff down our throats!!! Thank you! That clears it up! I will stick with kuh-fear like I posted above. It’s amazing how much attention a 2-syllable word can cause! LOL! So glad you posted this. I did not realize there was a powder option. Just ordered some. To make sure I’m understanding this correctly, are you saying that if I have some store bought bottled raw milk kefir (for consuming) I bought from my local whole foods store, I can use some of that kefir to make more kefir with my raw milk? I’m confused because you’re saying to keep about a cup of that kefir and mix with milk to make more. But then people talk about kefir grains for making more kefir, or in your case, the powder option. Why would I need to buy the grains or powder if I just keep using some from my drink container to make more? And what do people mean when they say their grains are sprouting more? Should I be able to see the “grains” (bacteria) in the drink when I make more? That’s how I make my yogurt, by mixing in good store bought yogurt, so it seemz like if would wodk with kefir. It gets weak over time, though. It should work to simply use the kefir you already have. I have not done it that way before. I made it this way yesterday- I used some store-bought kefir and placed one cup in a jar along with a quart of milk, shook it well and let it set for 24 hours. It worked! I was very pleased with the result- we just had our first kefir smoothies for lunch and they were a big hit! the bottom of a old spaghetti sauce jar, add whole milk almost to the top, shake it a few times, and then let it sit on the counter until the milk gels and the whey (clearish liquid) forms. Regarding reproduction–what happens is, as you strain a batch, and start a new one, the grains start to multiply. So I started with 2 tablespoons, and now, after about a month, I have probably close to a cup. I am making several jars of it, and giving some away. In Russia it was pronounced ke-FEER (with a slight rolling R). It was odd coming home to my mom saying KEE-fir. Now I say them both equally. Ha. I remember my Grandma asking if Mos-cow or Mos-co was the right way to say the capital of Russia. I said, “It’s Mosk-va.” I think it’s just one of these words we’ve English-ized. But as long as we’re all communicating, it’s fine. Did you do the drawing for the three ladies to receive the Kefir from Cultures for Life. In your post on Friday, June 1st, you said the winners would be announced on June 4th. I don’t see those results. Thanks. I’m afraid I sounded a bit know-it-all and rude there. Sorry for that! Another interesting thing: in Ukraine, kefir is made by letting milk sit out. that’s all. no adding grains or anything. I assume it must be because it was raw. (I didn’t know it was.) But if that’s the way it is, then why do we even need grains or cultures to make kefir if we have raw milk? We have been drinking kefir for many years! We ship out kefir grains every day from our store, so I wanted to clear up a few things as we get lots of questions from customers. There is a drawback with using powdered starter vs. grains. The powdered has about 10 strains of beneficial bacterium and the grains have around 50. It is a much healthier product using grains. You definitely do not want to heat your raw milk! That is not a necessary step in the least. It is so easy to make kefir with grains. Just plop them in, add milk, and wait. ;) As far as the concern about keeping them alive, if you need to take a break from kefir making just rest the grains in some fresh milk in the fridge for a week. You would want to change the milk out weekly. This basically slows down the culturing process, and yet gives them something to feed on while you take a break. You can make coconut milk/alternative milk kefir but if you use grains, they must feed on dairy between batches to keep them alive. So what people do is rest the grains in dairy for a day between batches. As far as being palatable, we drink kefir mostly in smoothies. Mix with banana and berries. Delic! Also, adding some vanilla tones down the tartness quite a bit. Water kefir is a totally different product using water, sugar, and fruit. You can create a variety of different flavors and it is a great way to wean someone off sodas. So how about making it from store-bought kefir (or some left from your last batch?) Does that still have as many good strains of bacteria in it? You said the kefir would make about eight batches with the starter. How do you know when you need to make a fresh batch? Is there a taste or consistency change to clue you in? Thanks for this post. I have been curious about making kefir for a while but didn’t realize how easy it was. Yep, true Russian pronunciation is ku-FEER. Cultures for Health says regarding the powdered kefir starter: “Upon receipt, the dairy grains can be rehydrated in fresh milk (this process usually takes 5-7 days) and then used to make kefir by adding the grains to fresh milk, stirring, covering and leaving at room temperature until the desired consistency is reached.” you are not supposed to just dump it all into the milk. I bought the Kefir grains from Cultures For Health about a year ago. I tried making Kefir from them for several weeks, wasting many, many cups of organic milk. I gave up because it never worked right and I was tired of wasting the expensive milk. I now have read from a few different sources that dehydrated grains are harder to get to work right. Not sure if that is what the problem was but it was very discouraging (and expensive!!). I tried ordering a few packs of the powdered Kefir when you ran this post but I got a call and email saying that they are out of this product for at least a month. I bought some organic Kefir from the store and I will try to use some of that to make more. 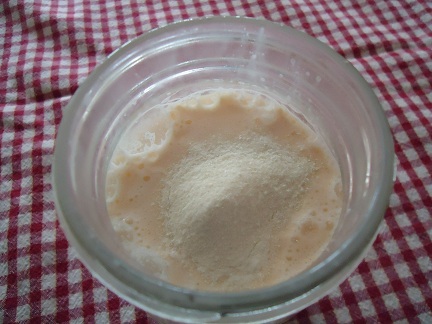 look at http://momsaware.org/food-probiotics/71-how-to-make-dairy-kefir.html It has good info. HOW to make dairy kefir…also sources where to buy kefir that is not the dehydrated form (like the kind from Culture for Health) which is trickier to use/get started. ok..I have been trying to rehydrate my kefir grains (1st time user) the first day nothing really happened. second day with new milk it was thicker and I strained it but clumps of milk stuck to grains..got most out I think..let it sit in new milk for 48hrs..nice and thick…but finding my grains was difficult..dumped thick milk attached grains, and spooned a few more out but most in a clump..and trying to see if by morning ready to use..how in the world am I supposed to just get the grains out without washing or picking through with my fingers and trying to clean them. Or is it ok to dump a clump of milk filled with grains in? Not sure I even have all my grains at this point. so confused..powdered sounds easier. Changing milk out every day seems such a waste and even with strainer not all milk fell through so had grains stuck in clumps. Advice? sorry for long confusing post. Its after midnight and I couldn’t sleep it was bothering me so much so hence the confusing post I am sure! :) It did taste tart but smelled yeasty a bit. Hoping tomorrow it will have made some and I won’t be confused anymore but is it ok if I accidentally eat the grains since hard to find so far? Yes, powdered is much easier, which is why I switched back! Yes, it is okay if you accidentally eat some of the grains. They are hard to find sometimes! Hey, thank you so much! Worked on the first try. I was happy to find a way to do this without heating the milk. Can you please explain how to make the next batch using the kefir I already have? Same measurements plus the cup of already made kefir? Thanks!! Can I use the same jar or is that gross? How will I know when the starter’s not working anymore? Is it obvious? I don’t understand why the ‘Grains’ won’t grow from the powder? I am getting great Keefur from the powder it’s going on and on. This is a mystery to me,surely the grains are the original culture evolving and growing? Thank you! I bought the powder and followed all the complicated directions and it didn’t even really work. I’ve been too scared to use the second packet! Gonna try this now! hi – thanks for the tips, particularly about restarting kefir using kefir. I was doing about 5 things and dumped my kefir powder into milk that I had just heated (i didn’t realize heating wasn’t an essential step) -..
will that not work at all? could I just dump another bag into the same milk after it cools? As long as the milk wasn’t super hot, it should still be okay. I’d wait and see what happens before dumping in another bag. thanks. it seems usable but a little “off” compared to my first batch (I thought slightly sour), but (after I tested it) my picky 7 year old scarfed it down. Another question about how it looks: first batch I made formed a somewhat solid mass within a pool of liquid. A batch I just did looks more like a thickened liquid…ever seen the solid mass? seems like third time is the “charm”. Hmmmm, not sure why it would form a solid mass. It should incorporate again if you shake it up. If it doesn’t then I am not sure I would use it. Hope that helps! One of the resources I also go to is http://www.yourkefirsource.com/kefir – there’s an updated list of questions there that they answer when someone emails them. It could be useful to some of your readers. Just wondering if you have any recommendations for powdered water kefir starter. The only one I know of is thru Body Ecology… but they add inulsin to it!!! My intestines can not handle inulin. I’ve been making dairy milk and goat milk kefir for years and years and use kefir “grains”. My family enjoys drinking it as a smoothie with berries and all kinds of other good superfoods. I’ve made coconut milk kefir very successfully using the kefir grains for dairy milk. This is an amazing drink that is full of “live” cultures and drinking this makes you feel more energized and healthy. People have been drinking kefir for centuries and have used it for general good health and as a way of preserving milk without refrigeration. Thank-you for some great information about this wonderful drink. I’ve fermented my kefir up to 4 weeks successfully. It becomes very tangy and sour, but very delicious in a smoothie. My parents lived in the Middle East for many years; my mom actually went out to visit/stay with the Bedouins after the first Gulf War. They pronounce it ‘kay-fair’. When she lived in Turkey it was pronounced ‘keh-fear’. In Jordan it was ‘kuh-fear’. I don’t think there is a right or wrong way to pronounce it. We’ve always just called it ‘keh-fur’, probably because my strong Texas accent translated it that way! My plan is 1/4 batch liquid kefir and 1/4 batch of kefir yogurt and turning the rest into cheese. I also want to take this opportunity to heap tons and tons of praise on those of you who realize how far away we’ve gotten from what real food should be and how badly we need to get it back – especially for our kids. Awesome job, young food warriors! Apologies if this has already been asked there is so much traffic here I can’t read it all. I bought some powdered Kefir at my local health food shop and when I got it home; on the packet it says can be used up to 2 times. I’m confused I thought once you got started Kefir just goes on and on infinitum? Maybe you could shed some light? Hi, my kefir powder I bought was kinda clumped into bits and not at all powdery, decided to try it anyway but I don’t think it worked as the bits just floated and milk didn’t thicken at all…does this mean the powder was bad to begin with? sorry if this is a dumb question but I haven’t been able to find anything on the net about the powder being clumped. Hmm, yes I don’t think it should have been clumped. It should dissolve easily. Can anyone spare me some dry kefir grains. It’s definitely pronounced “kuh-FEAR” not “KEE-fur”. You’re confusing a fermented beverage with Donald Sutherland’s son. I bought the kefir culture powder to try and do homemade kefir.I don’t have the yogurt maker.Could you please explain to me how to di it? I love kefir. The original pronouciation from the people of the caucasus mountains in eurasia is keh-FEER. The pronouciation and etymology have been on Wikipedia for quite some time. I first heard of it 10-15 years ago and never heard kEE-fir until the past few years here in America. Help! Lol. First time making kefir. I’m using freeze-dried kefir starter (is that the same thing as powder? I’m assuming that kefir grains are the curdled things that will result from my kefir making??). Anyway, i simply poured the starter into bottom of glass jar and added my (is already refridgerated ok??????) raw goats milk. The powder is clumpy and not disolving. Can i stir? Can i shake? Thx in advance for your help!! !